Figure 1. A sinusoidal wave. Figure 2. Decision Threshold Lines. Figure 3. Plan for a state-discriminating receiver. A signal with horizontal polarization and a local-oscillator (OL) with vertical polarization enter a polarizing beam splitter (PBS) and propagate together through a series of beam splitters (BS) and state-discriminating stages (SD). At each stage the signal interferes with a fraction of the local oscillator output. Figure 4. JQI Noise Reduction Achievement. “That’s not what I meant”: human communication is fraught with misinterpretation. Written out in longhand, words and letters can be misread. A telegraph clerk can mistake a dot for a dash. 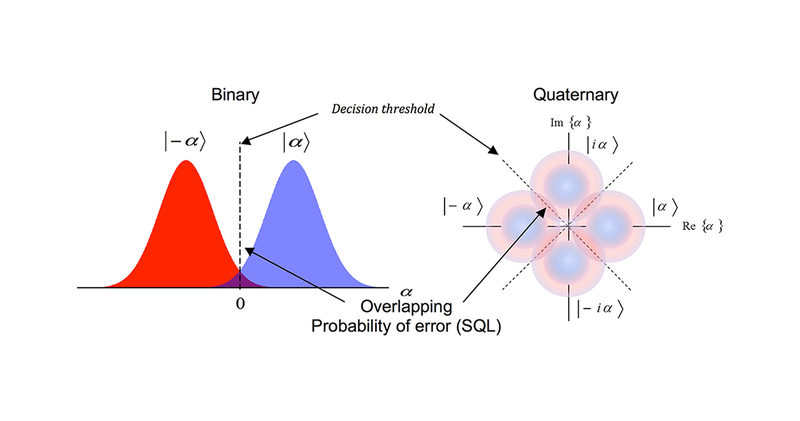 Noise will always be with us, but at least a new JQI (*) device has established a new standard for reading quantum information with a minimum of uncertainty. Success has come by viewing light pulses not with a single passive detector with but an adaptive network of detectors with feedback. The work on JQI’s new, more assured photonic protocol was led by Francisco Becerra and carried out in Alan Migdall’s JQI lab. They report their results in Nature Photonics (**). Here are some things you need to know to appreciate this development. Digital data, in its simplest form, can be read with a process called on-off keying: a detector senses the intensity of incoming bursts of electrons in wires or photons through fibers and assigns a value of 0 or 1. A more sophisticated approach to modulating a signal (not merely off/on) is to encode data in the phase of the pulse. 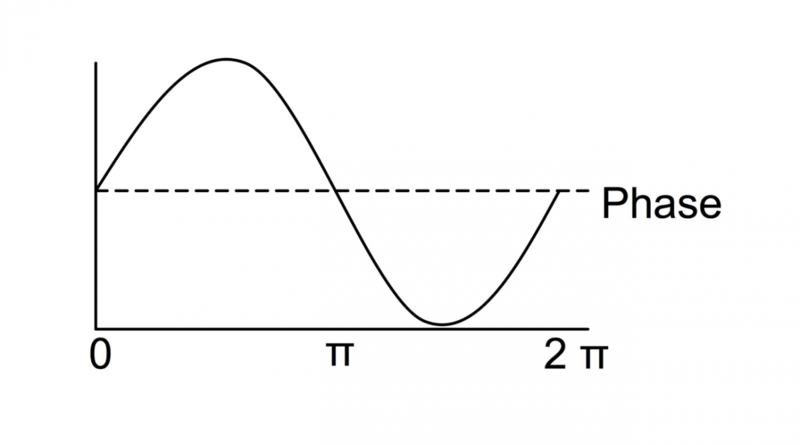 In “phase-shift keying,” information is encoded in the amount of phase shift imposed on a carrier wave; the phase of the wave is how far along the wave cycle you happen to be (say, at the top of a crest or the bottom of a trough in a sinusoidal, as in figure 1). Larger words can be assembled from a small suite of symbols. The Roman alphabet has 26 letters, the Greek only 24. Binary logic, and most transistors, makes do with just a two-letter alphabet. Everything is a 0 or a 1, and larger numbers and letters and words are assembled from as many binary bits as are necessary. But what if we enlarged the alphabet from two to four? In quaternary logic more data can be conveyed in a single pulse. The cost of this increase is having to write and read 4 states of modulation (or 4 symbols). Even more efficient in terms of packing data, but correspondingly more difficult to implement, is logic based on 6 states, or 8, or any higher number. Digital data at its most basic---at the level of transistor---remains in binary form, but for communicating this data, higher number alphabets can be used. In fact, high-definition television delivery already involves high-level logic. No matter what kind of logic is used, errors creep in. A detector doesn’t just unequivocally measure a 0 or a 1. The reading process is imperfect. And even worse, the state of the light pulse is inherently uncertain, and that is a real problem when the light pulses belong to a set of overlapping states. This is illustrated in figure 2 (above) for binary and quaternary phase states. By combining many such stages (see figure 3) and using information gained by previous stages to adjust the phase of the reference wave in successive stages, a better estimate of the signal phase can be obtained. 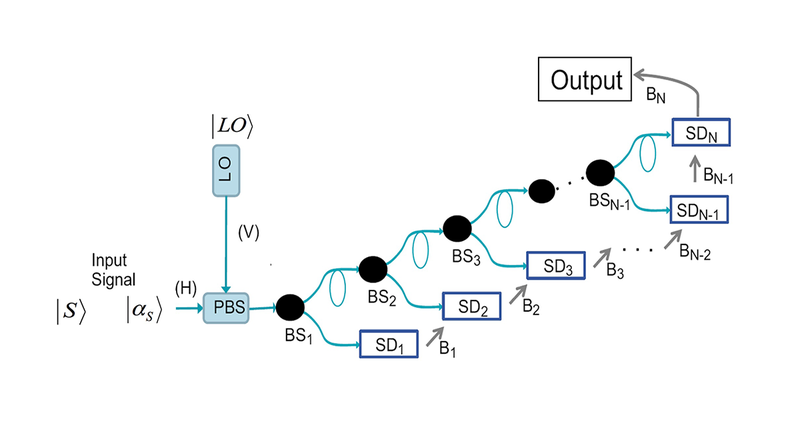 Detecting phase in this adaptive way, and implemented in a feedback manner, the JQI system is able to beat the standard quantum limit for a set of 4 states (quaternary) encoding information as a phase. These states are represented as fuzzy distributions arranged at different angles around a circle as seen in figure 2 (above) where the angles represent the phase of the light pulses. The error probabilities measured for the system (black points with error bars) fall well below the quantum limit, by about 6 decibels in the center of the curve. This is equivalent to saying that the JQI receiver is performing better than the SQL by a factor of about 4 in determining the phase of an incoming signal. 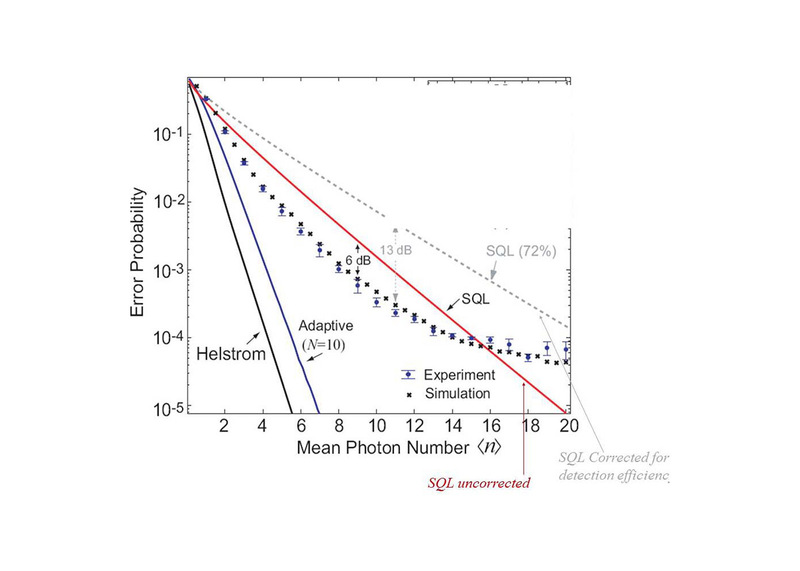 That is, the JQI receiver achieves an error probability that is 4 times lower than the so-called “Standard Quantum Limit.” This graph shows results for a system that implements 10 adaptive measurements. The two other lines on the chart show what the expected uncertainty would be for a perfect system (100% efficient detectors) and without any of the imperfections that would be encountered in any realistic implementation, and a hypothetical ultimate-limit on uncertainty derived by Helstrom. (*)The Joint Quantum Institute (JQI) is operated jointly by the National Institute of Standards and Technology in Gaithersburg, MD and the University of Maryland in College Park.